Oliver Schmitt aka Sounds of Revolution enjoys a steadily growing popularity with his”Revolution” sample series. DJ Tiesto, Adam Beyer, Timo Maas and Stephan Bodzin all recently avowed themselves being fans and supporters of his latest sample libraries. After the successful FX, Kick-free and Electro House editions, which have been rated 10/10 points by diverse leading producer journals, the german sound wizard finally fields the next sampling specialist through Resonance Sound. The multi awared Minimal Techno Revolution Vol.1 offers far more than its predecessors, over 2000 variable high quality samples in number! The approximate 1500 single sounds divide into Bass and Synth Sounds, Fragments, Kick Drums, Claps, Cymbals, FX, Percs and Toms -whereas all Bass and Synth Sounds even have their own playable programs / instruments, so they can be played instantly and don’t need to get mapped. In short: ‘Minimal Techno Revolution’ unites all you need for the production of powerful and intoxicating modern Minimal and Techno on one single sample pack and beyond that even encourages your creativity. We’re using Oliver’s sounds ever since we got the patches. Crystal clear, deep, warm & really well designed, very useful for us! Looking forward to new sounds from this man! Oliver Schmitt’s sound sets are a must have library for any dance producer. The variation in patches is superb and the pads are stunning’ most of all they are usuable and not throw away sounds! – Excellent. The sounds of SOR convinced me from the first moment I played them. The purity and complexity of the patches is incredible. You get really inspired when it comes to new melodies. SOR is the all in one solution for modern music production – no matter what style you prefer! Sounds Of Revolution has the sounds for trance music that really suits my Kuffdam style. Great work on the high quality samples and I’ll be using these on forthcoming products. If you produce electronic dance music you need the best samples out there. SOR delivers these! Everyone knows the times when you are in the studio without any inspiration, just staring at the screen wasting your precious time. If you then check the SOR samples inspiration will instantly hit you like an avalanche. Unique samples which give the inspiration a producer needs. We especially like the beatloops which are unique and well designed and used in our new tracks. Putting them in your tracks makes your production instantly sound profi. We can recommend the SOR series for every starting and advanced producer!!! When I first tried the sounds of SOR I was very impressed. The superb quality of the patches makes my production life much easier. The patches are ready to use – only very little additional processing is necessary. The best thing of SOR: Their sound design is really different! I have to say very cool library! All the sounds are very well recorded and manipulated. Other products sometimes are too “clear”…you use cool distortions / chorus / eventide effects etc…..also the kicks are super fat! The sound banks are quite original and different in comparison with other sample providers, offering more depth, uniqueness and possibilities to your compositions. 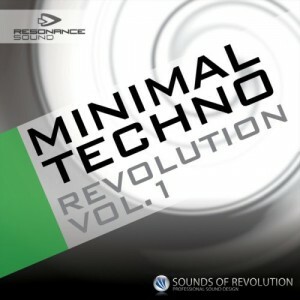 My favourite out of the packages is the Minimal Techno Revolution sound bank, and recommend everyone to check it out! Conclusion: […]I can’t think of anything better than Minimal Techno Revolution right now. The skills of Oliver Schmitt when it comes to drum loops are considerable and he truly masters the art of creating sparse and highly intelligent loops that both inspires and leaves room for your own drum sounds, which is a rare combination. On the whole, a very good library for anyone who needs to get back to techno. Bekannte DJs und Produzenten wie DJ Tiësto oder Blank & Jones zählen sich zu den Fans und Unterstützern der Sample-Kollektionen des Sound-Designers Oliver Schmitt. Mit Minimal Techno Revolution Vol 1 legt er ein 3,16 GB großes Sample-Paket vor, das sein Renommee noch untermauern wird. Insgesamt erwarten Sie über 2000 Samples, darunter etwa 700 Bass-, Drum- und Synthesizer-Loops im WAV-, REX2- und Apple-Loops-Format sowie etwa 1500 One-Shots als WAV-Dateien inklusive einzelnen Drum- und Effektsounds, Klangfragmenten und Bass- und Synthesizersounds. Letztgenannte liegen für eine direkte Spielbarkeit auch als EXS24- und Kontakt-Patches vor. Das musikalisch hervorragend einsetzbare Klangmaterial kann sich hören lassen: Druckvoll, futuristisch und vielseitig tönt es aus den Boxen. Klasse!